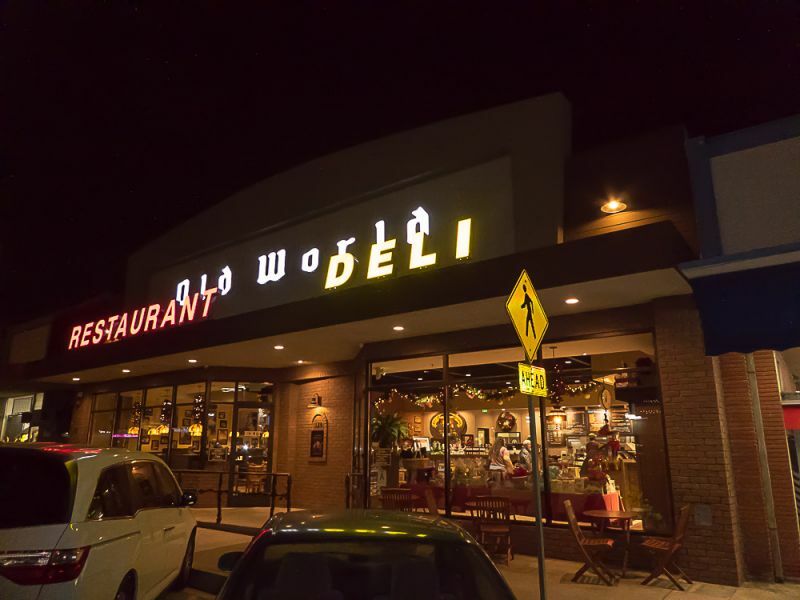 When I was a child a big treat for my family was to go to The Old World Deli for lunch or dinner. It was located in a strip mall outside one of the only major malls in the area. People of a certain age from the Southern California area can attest to the Eastland Mall being the “it place to be” in the 1970’s. (Wow, am I showing my age here or what?) I can remember going there as young as maybe eight years old to eat the very authentic Italian family style food. My mother was a single parent, so it was a big deal for us to eat a meal in a restaurant. I think this one, reminded my mother of her Italian family in Boston; from which she was so far. It was at The Old World Deli where I experienced my very first cannoli, and my first eggplant parmesan (My mother doesn’t cook at all). Back then, it was also the only place around that sold fresh ricotta cheese for me to make homemade lasagne and fresh marscapone cheese so I could test my fledgling chef wings on my own cannoli. Oh, the memories! As was back in Los Angeles visiting my family, I thought it was the perfect time to revisit The Old World Deli and share it with you. I really wanted to see if my memories of the place held up after all these years. I was heartbroken when I went to the location to find it gone. I nearly cried. A family business that had been in that location at least forty years… gone. I couldn’t stand the thought of it closing, so I immediately took to Google, who knows all. Thankfully, they had simply moved up the street and hadn’t gone out of business altogether. WHEW! Excitedly, I made a plan to take my mother and her friend to dinner that night. When I got to the new restaurant, I was both happy and sad. I really missed the old tired place that they used to have. This place was all new and far more modern. Still, they retained many of their old touches and I found that comforting. 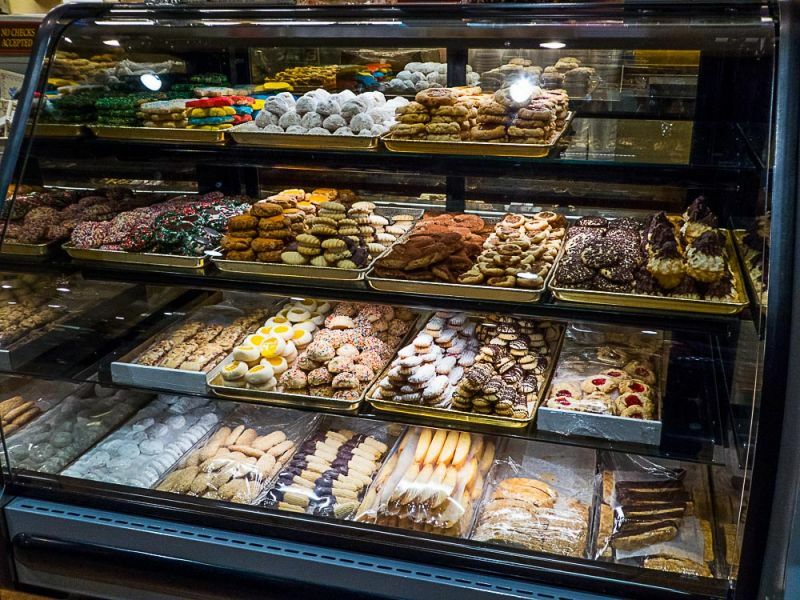 I was so excited to see their deli cases, their massive Italian cookie case, and their big display for cakes and treats; just like the old place. Hmm, maybe this wasn’t going to be so bad? I looked at the menu; it was exactly the same too. There were trays of cookie platters all made up for Christmas, just like the old days when I was a child. My mother ordered her favorite eggplant parmesan and her friend ordered the dinner special of lasagna and salad. 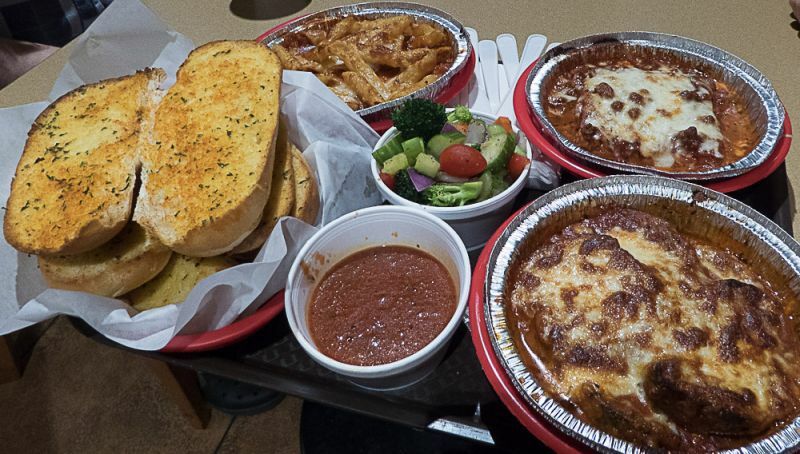 The eggplant parmesan was a whopping $8.95. It doesn’t get better than that for value. The dish comes with bread and if you want a salad it adds an extra couple of dollars and includes a drink. 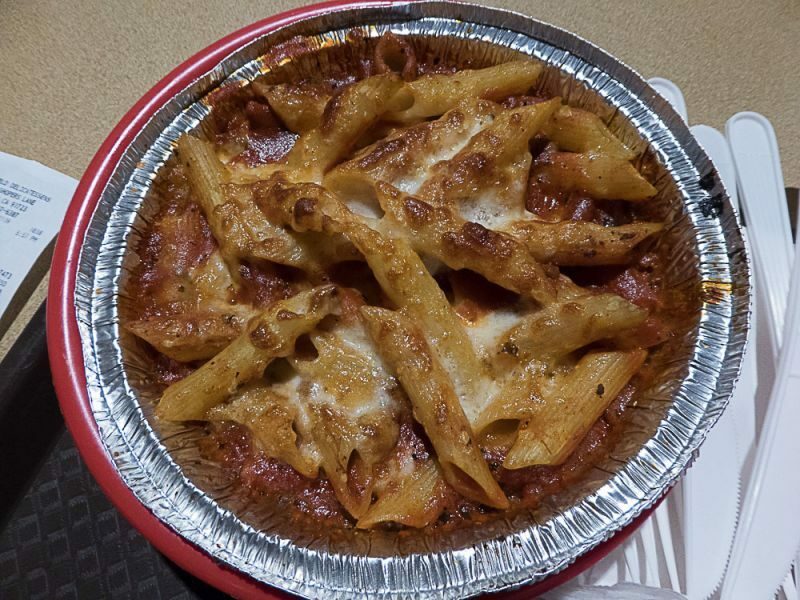 I ordered the mostaccioli baked pasta just for old-time sake and to have some variety from the other two ladies. When our food came we were all very excited. Although the food is served in aluminum foil dishes and plastic baskets, don’t let that fool you. This is the real deal; old style Italian from your childhood. The sauce (sugu or gravy for those of us of Italian heritage) was firmly tomato, with a good flavor of the sausage they use. It is delicious. They even include extra on the side to make sure you have all you need. Everything was fresh, hot, and absolutely beautifully cooked. My mother shared with me a bite of her eggplant parmigiana; it was delicious. The eggplant was tender and plentiful with a fantastic sauce and plenty of melty mozzarella goodness on top. Yummy. As a home chef now, I like mine to have a little crispier texture, but you couldn’t beat the flavor. I tasted our friend’s lasagne. It is definitely an old 1970’s style American version of the dish rather than traditional Italian, but guess what? I didn’t care. 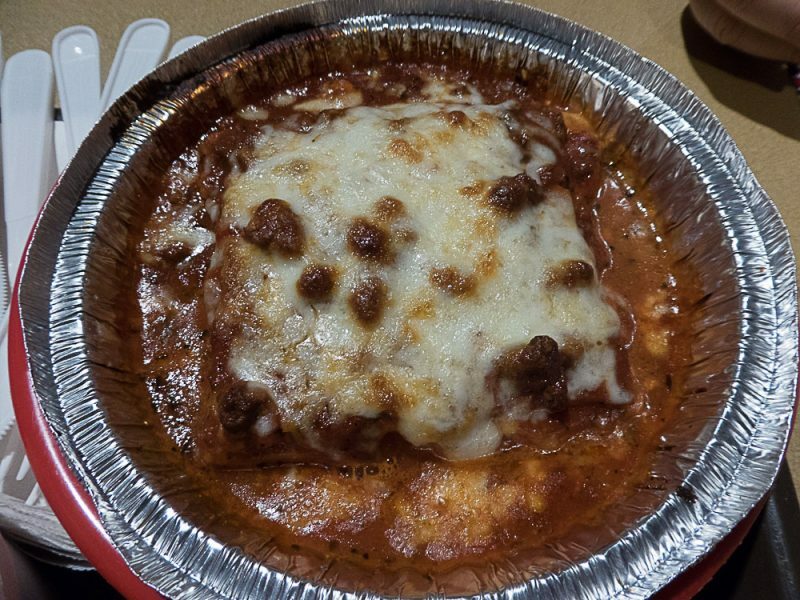 Layers of pasta, meat cheese, and sauce all melty and gooey with amazing flavors. What more could you want from the dish? Sure you could have it with either seven layers of different cheeses or go really old school with just béchamel and mozzarella, but I have a soft spot for this version too. My mostaccioli was wonderful. 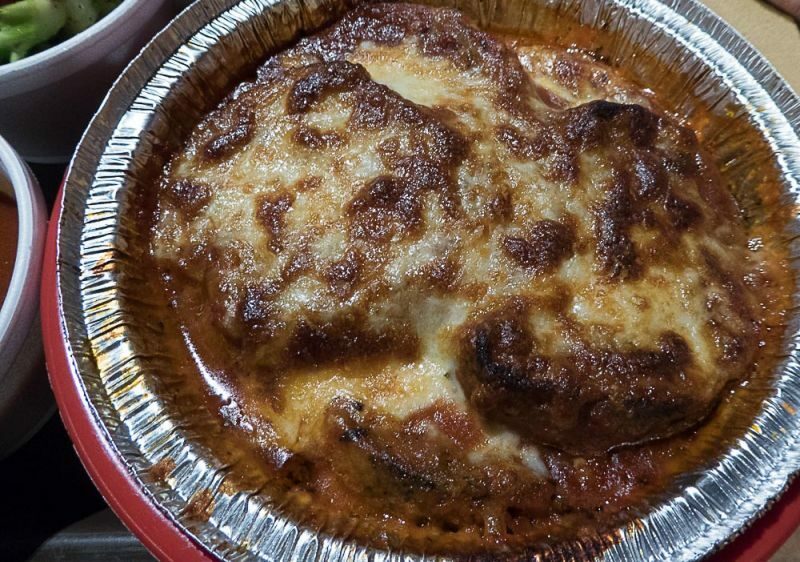 The same rich sausage flavored sauce that was used with both the eggplant parmigiano and the lasagne was in my dish and then baked with mozzarella. They included extra sauce, so although it didn’t need it, I still ladled it on my food. I mean you can’t let all that goodness go to waste right? With all our dishes they served loads and loads of garlic bread. It was a carb overload, but we didn’t hesitate to dig right in. With my dinner I ordered a glass of the house Chianti. I had never had wine there before, and the bottles of wine I saw were not really my style. Still, as a good blogger it is my duty to report on every aspect. I know that you all want to know about the wine. Well…. no one in Napa would be racing down to LA to drink this wine. It was served over chilled (cold as though it were white wine, but really even too cold for that) and in a plastic cup. Triple yikes. I tried hard to warm it up with my hands and see what it was really like, but the best thing I can say is that I drank it. It wasn’t horrible. I guess growing up I never ordered wine from there. I wish Old World Deli would serve some of the wonderful Sangiovese that is offered here in California these days. After dinner I had to order dessert for all of us to try. 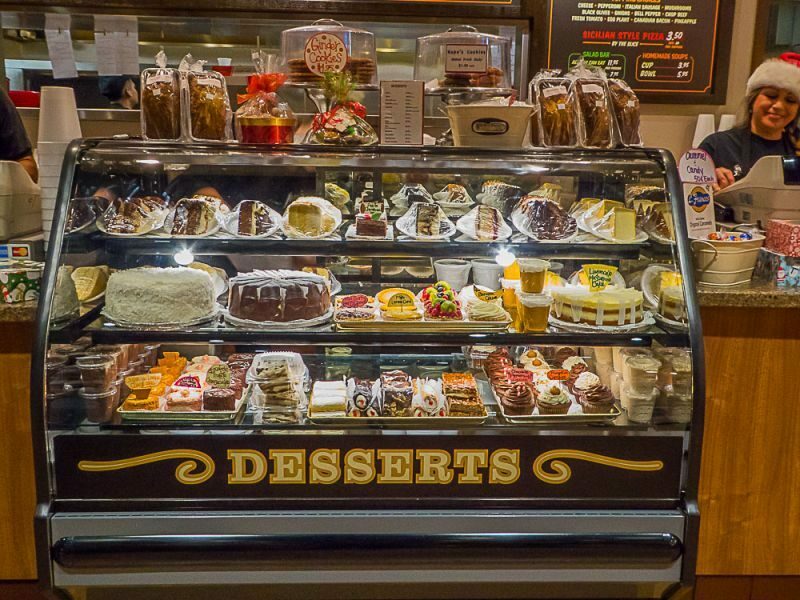 Their desserts range from about $2.95 to $6.95 for individual cakes and treats. I ordered a selection of four that I let the staff choose for me. We ended up having: the raspberry and cream cake, the limoncello cake, the lemon chiffon cake, and the fruit tart. So then the taste test was on! Which was the favorite dessert? 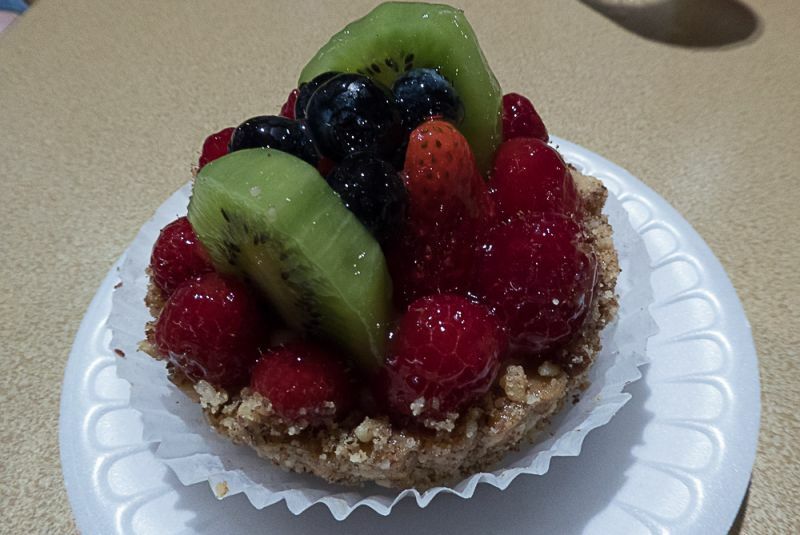 I have to say that the fruit tart won for looks. Honestly, I’d put this tart up against any I have seen in bakeries in Napa. It had both a shortcrust pastry and a hazelnut thing going on for the crust, a chocolate layer, then a pastry cream layer, the fruit, and then the glaze. It was a wow. The whole thing was fresh, perfect, and just awesome. All of the fruits were sweet and delicious. I wish I was a good enough chef to make this one. It’s a knock out! 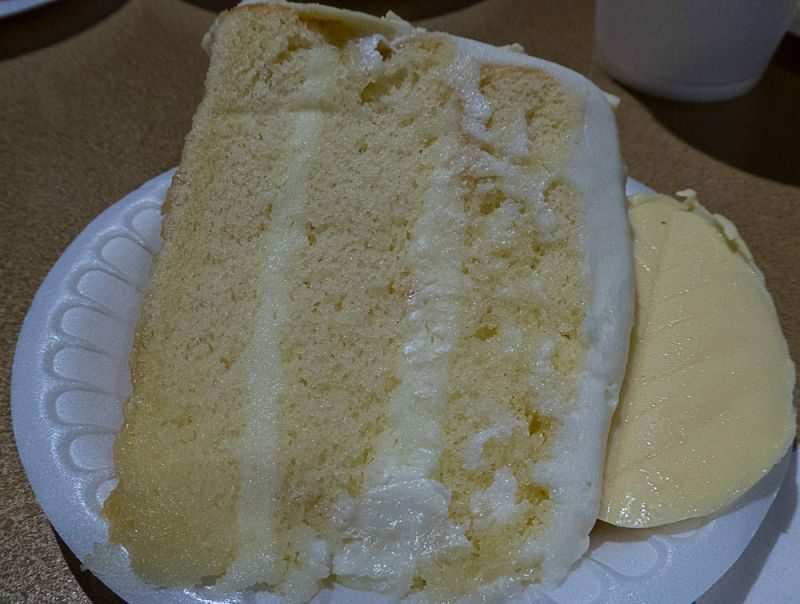 The second one we tried was the lemon chiffon cake. It was moist and had good lemon flavor. 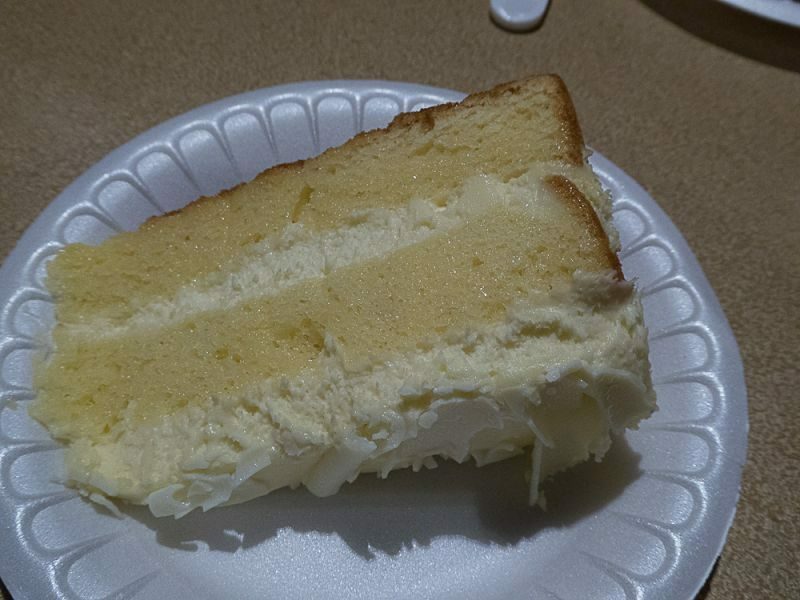 The texture was just slightly rough, which made it less than my perfect bite. It had shavings and a disc of white chocolate on top and sides to give it a wonderful finish. This was my mother’s favorite, although she did mention several times that there was no chocolate dessert in the selection. 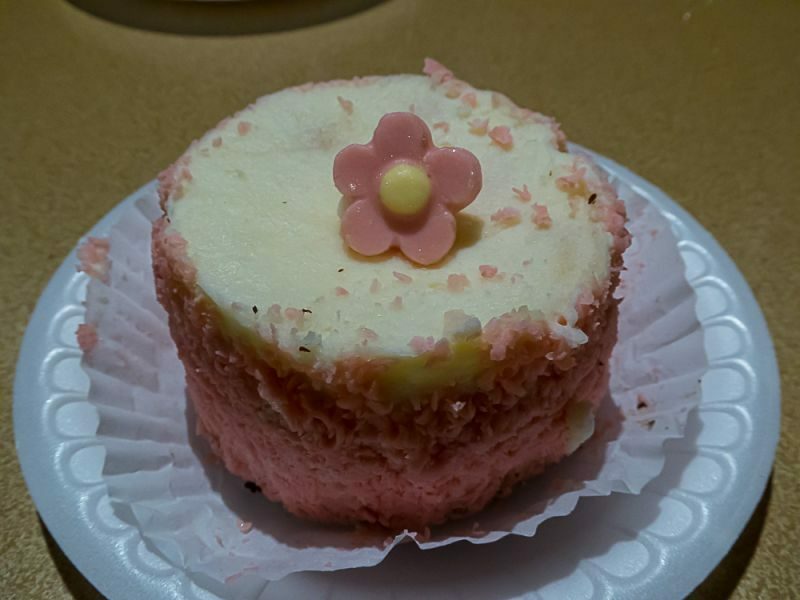 The third dessert item was a raspberry cream mini-layer cake. This one was holy moly outstanding. It was a little crushed on the outside, but when you cut into it and got all of that raspberry it was so good I didn’t even want to share. It’s a good thing that I have a two bite rule for desserts I like, because I could have eaten this whole thing alone, with a glass of wine… in a dark room… listening to sad music. You know what I am saying ladies right? CRAZY good! I’d be happy to serve this at one of my parties it was that good and that original. The final dessert, was a limoncello cake. This was my second favorite. I was just overwhelmed with the amazing flavor and texture; rich, moist, and lemony. I loved this choice! I thought it was so outstanding in every way; I would happily eat it any time, despite not being a lemon fan in general. YUMMY. It is fun now being a blogger going back to these little places of my memory and putting them to the test of my grown-up , sophisticated palate. I eat so much gourmet food these days, that it is really nice to eat something that feels familiar, yet also oh so good. 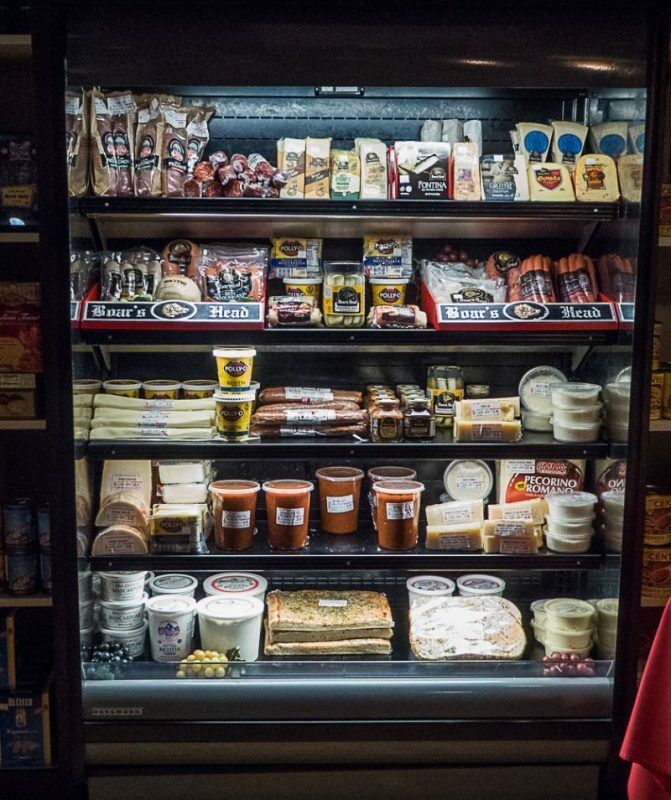 I would highly recommend you visit The Old World Deli. After having traveled the world and tasted fine Italian cuisines all over, I still love it. Delicious!